Branding, personal branding, brand vision...if you own a business or are thinking about starting one, it is likely that someone advised you to build your brand. Everyone is talking branding these days - it’s one of those buzzwords that gets thrown around without much actually being said about what branding actually is and how it fits into your business marketing. 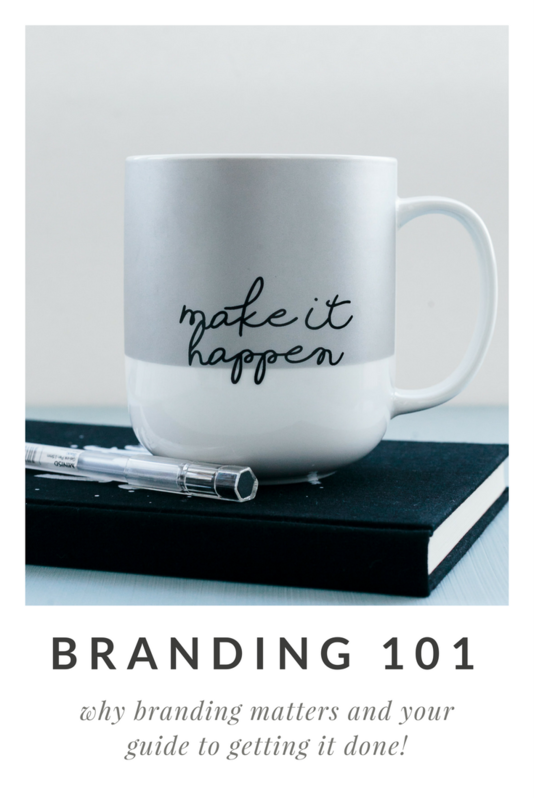 Well, I’m here to give you some much-needed clarity on branding so you can stop feeling overwhelmed and starting getting your brand’s ducks in a row! “the process involved in creating a unique name and image for a product in the consumers' mind, mainly through advertising campaigns with a consistent theme. Let me guess? You eyes just glazed over reading that? Yeah...I don’t blame you. What is it about dictionaries that they can make things that are super interesting sound so dry? So what is branding, really? At its core, branding is how your audience or customer base perceives you, based on all every touch point they’ve had with you. It’s the result of the story you tell about who your business is each time they interact with it. Not that complicated. But if it were simple, you probably wouldn’t be here, right? So let’s dig in! I’ll tell you why you should care in two words: branding works. We work in an environment dominated by competition. There are lots of people doing what you do and selling what you sell. Branding is how you can make you or your business stand out. Branding is how you remind people that while lots of people offer virtually the same service or virtually the same product, there is only one you doing it your way. By reminding people over and over about who you are, what you represent, and highlighting your unique selling points you can stand out in the ocean of competitors that can at times make you feel like you’re drowning. 25% of millennials say brand loyalty drives their purchasing decisions. Brand awareness is a major factor when making purchasing decisions for 75% of all customers. 85% of customers choose familiar brands over unknown ones. Next step? Branding your business aka Doing The Damn Thing. So, You Want to Brand Your Business? Start With 'Why'. When jumping into branding their businesses, many people think that they just need to pick a new logo (note: a logo is not a brand, and a brand is not a logo), but beyond the fact that branding is much more than simply some font and a swash or two this is putting the cart before the horse. First, you need to understand your business. You need to sit down and do the hard work of really defining what your business represents, what you do, what your values are, who your customers are, what their values are, what their problems are and how your business solves them, and lastly, who your competitors are. Basically, you need to ‘define your why’. Yeah. It’s a lot. But doing this work will change how you look at your business, help you clarify what your messaging needs to be, and ultimately make every step of your branding, marketing, and sales process much easier than it otherwise would be. You’re also going to make more money because...you know...you know what you’re selling and who you’re selling it to. Make a list of your business values – determine your core values. This will help you create a brand that taps into an audience with similar values. Figure out your business’s essence – think of your business in terms of personality traits. Come up with a few words or phrases that describe your business’ essence and use them throughout your branding. Define your purpose– brainstorm about your business’s purpose; its reason for existing. Then craft that sentiment into a mission statement. Knowing your audience and what they want is half of the business branding battle. Ask yourself who would be interested in your services. Consider your potential customer’s age range, gender, social status, dating tendencies, what stage of life are they in, their education level, where do they live, what is their job title, and so on and so forth. Be specific and go into detail. Think about your ideal customer as a real person. Who are they? Give them a name, describe their likes/dislikes and what they do on a Saturday afternoon. Get to know your ideal customer like they are real. Getting into the mindset of your customer helps you know how to meet them where they are – both physically and mentally. Finally and most importantly identify their ‘pain points’ in relation to your product or service, and make sure that what you offer is relieving them of that problem. The answer to that needs to play a role in every choice you make with relation to brand messaging and content. Tip: I recommend researching Ideal Client Profiles in your spare time. Then create one for your ideal client. It will seem strange at first but it does help you to better understand your target market. During this start-up phase, you should get to know your competition. Find out which businesses are offering similar products and/or services. Study them and determine how your business is different. What can your business offer that they can’t? This isn’t an invitation to copy them. Nope, not a good idea, partly because it’s kind of sucky and partly because their brand is created to suit their business and is unique just as your brand needs to be unique. You have defined who you are, what your business offers, and who your customers are. Now it is time to create the essential components of your brand identity. A well-crafted brand tells your story and helps people remember what’s unique about your business. It defines your business identify and speaks clearly to your target audience about the product, service, and the people behind the business. You can create the ideal brand identity through a series of tried-and-true branding assets. Logo: logos are visual symbols that stand for the business’ identity. It is a pictorial version of the company’s reputation and can remind people of their associations with the company. Tagline and mottos: these succinct messages are used to communicate the business’s mission. The most successful taglines and mottos are short, catchy, and memorable. Visual Aesthetic: A business should strive for a consistent visual aesthetic. The marketing logo, website, blog, e-mail newsletters, product packaging, social media profiles, and marketing materials should have a similar, recognizable look. This means a consistent color palette, font, and design style. Voice: The voice is a defining element of a business’s brand identity. It is the tone, the vocabulary, and the syntax of the content. The voice should be consistent throughout all of the wording associated with the business; it should make the brand recognizable even in the absence of the visual brand elements. Now you have the tools to build a unique, memorable brand that tells your story and helps people remember your business. Use them wisely. Build your business’s brand and stick with it. Consistency is the key to successfully shaping how customers view your business. Get working so your business can get really thrive!